By suspending tiny metal nanoparticles in liquids, Duke University scientists are brewing up conductive ink-jet printer "inks" to print inexpensive, customizable circuit patterns on just about any surface. "The nanowires had a 4,000 times higher conductivity than the more commonly used silver nanoparticles that you would find in printed antennas for RFID tags," said Benjamin Wiley, assistant professor of chemistry at Duke. "So if you use nanowires, then you don't have to heat the printed circuits up to such high temperature and you can use cheaper plastics or paper." "There is really nothing else I can think of besides these silver nanowires that you can just print and it's simply conductive, without any post-processing," Wiley added. "We wanted to eliminate any extra materials from the inks and simply hone in on the amount of silver in the films and the contacts between the nanostructures as the only source of variability," said Ian Stewart, a recent graduate student in Wiley's lab and first author on the ACS paper. 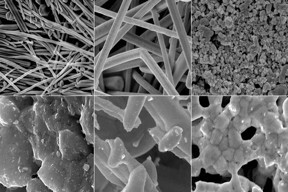 Stewart used known recipes to cook up silver nanostructures with different shapes, including nanoparticles, microflakes, and short and long nanowires, and mixed these nanostructures with distilled water to make simple "inks." He then invented a quick and easy way to make thin films using equipment available in just about any lab -- glass slides and double-sided tape. "We used a hole punch to cut out wells from double-sided tape and stuck these to glass slides," Stewart said. By adding a precise volume of ink into each tape "well" and then heating the wells -- either to relatively low temperature to simply evaporate the water or to higher temperatures to begin melting the structures together -- he created a variety of films to test. The team say they weren't surprised that the long nanowire films had the highest conductivity. Electrons usually flow easily through individual nanostructures but get stuck when they have to jump from one structure to the next, Wiley explained, and long nanowires greatly reduce the number of times the electrons have to make this "jump". But they were surprised at just how drastic the change was. "The resistivity of the long silver nanowire films is several orders of magnitude lower than silver nanoparticles and only 10 times greater than pure silver," Stewart said.